It’s almost time for that school bell to ring again—are your kids ready? Your Lynnwood dentist, Dr. Martin, knows assembling notebooks, pens, calculators and the countless other items on a school supply list can be daunting to a parent’s pocketbook. However, here’s something you don’t want to overlook. As a parent, you likely work hard to instruct your children on the value of keeping their teeth healthy and safe by means of brushing, flossing, and regular dental visits. Regardless of how healthy their teeth are though, they’re still vulnerable to sports-related injuries. How can you protect your child from becoming one of the 5-million who have teeth knocked out during sporting activities each year? A toothless grin may be cute in grade school, but not so much later in life. 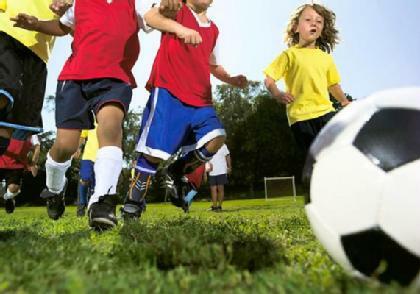 If your child participates in impact sports, even non-competitive games among friends, be sure to have them fitted by our Lynnwood dental team for a sports mouthguard. The second it will take them to slip it over their teeth in a game can save you thousands. Our custom-fitted mouthguards can make the difference between an unexpected blow injuring their teeth, jaw bone, gums, and tongue or simply bruising their pride. Wearing shoes that aren’t your size feels clumsy, and there’s a good chance you’ll ditch them at the first opportunity. Mouthguards available for purchase in sporting-goods stores are much like that. Generally of the boil-and-bite variety, they aren’t custom-fit for your unique mouth. The danger arises that not only may a one-size-fits-all mouthguard not remain securely seated when in play, but that it’s far less likely to actually be worn because it’s bulky and uncomfortable.. Our customized mouthguards are made to fit your child’s mouth perfectly, keeping their focus on the game, not on the mouthguard. Of course life isn’t all about play, and at the end of the day we all need a good night’s sleep. For some, sleep can be damaging. Why is this so? Bruxism (also known as teeth grinding) is a formidable foe because most remain unaware they’re clenching and grinding their teeth while they sleep. How can you know? Some symptoms include waking fatigued, with a dull headache or sore facial muscles, teeth that have become thin, worn down, flattened, fractured, or chipped, increased tooth sensitivity, TMJ disorders or an earache sensation. Our custom-designed mouthguards made from a durable, high quality material is a great way to put teeth grinding concerns to rest! Slipping this special nightguard over the teeth of one jaw helps prevent direct contact with opposing teeth, alleviating pressure damage associated with teeth grinding. Get exactly what you want for you and your families smile—maximum comfort, and superior protection– with Lynnwood dentist Dr. Martin.